Optional padlock allows for extra security and keycoding multiples for convenient access. Flush paddle handle with slip resistant grip offers easy fingertip operation and reduces dangerous "catches" from passing traffic. Double key set included for keyed lock. provides easy, fail-safe, positive door closure with increased heat resistance. directs spills to back and bottom of leak proof sump. Heavy-gauge galvanized steel shelves are bi-directional and easily adjust on 3" centers for versatile storage. 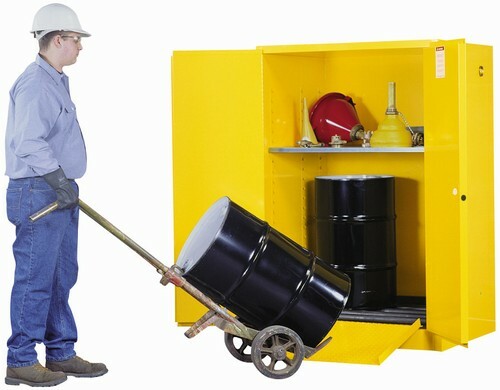 Meet ANSI standards with a 350lb safe allowable load. Firefighter friendly reflective band at bottom alerts firefighters when crawling in smoke-filled areas. Also provides high visibility in the dark under power outage when illuminated by a flashlight beam.